Ethereum is currently seeing around 100,000 new addresses per day, with the total number of new addresses doubling since December to now rise above 35 million. Comparable stats for bitcoin are no longer shown by its main block explorer, but according to the last known data in March, bitcoin had 24 million addresses while ethereum had 31 million. The comparison might not be very exact as in ethereum smart contracts are an address, but such smart contracts amount to only thousands, while the gap, at least in March, was some seven million. The above number does not necessarily correspond to actual ethereans, which may be more or less than 35 million. On the less end, because one can have many address. While on the other hand, many might be using exchanges and might never withdraw from it to another blockchain address. Going instead from fiat to the exchange to eth to fiat again without the individual ever touching the blockchain. The latter is probable because Coinbase alone has some 20 million users, while Japan’s FSA has revealed exchanges there have 3.5 million users. Coinbase is used in most of America and much of Europe too, while in Asia only South Korea would significantly add to those numbers. So it may well be that 35 million is actually not very far off. Another more concrete statistic may be the number of active addresses. Ethereum has managed to continuously surpass bitcoin on that front for the first time ever, with ethereum currently having 550,000 active addresses, while bitcoin stands at 472,000. Half a million on-chain active users does indicate that cryptos are still very small despite the significant amount of attention received particularly during December. That suggests blockchain tech and adoption is around the same period as internet’s adoption in the early 90s, before Google, Facebook and the rest. A fairly apt comparison considering that a number of ethereum smart contract based dapps can now be somewhat compared to the early usefulness of internet websites. Just as dial-up back then was slow and Bill Gates allegedly said 64kb is enough for everyone, so too public blockchains are currently slow and can’t process much data. 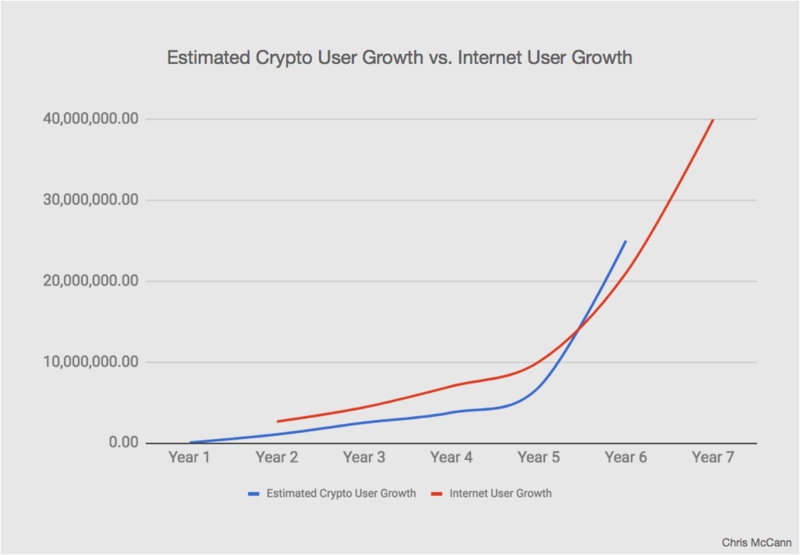 Constant incremental improvements, however, tend to have significant cumulative effects, but for now this space, while growing, is still very small, and within that small space ethereum seems to have the most active user base.